Visualizations are an integral part of any medical or healthcare knowledge presentation. Various documents and posters explaining the medical facts, the medical articles in printed editions and on websites, educational presentations - all this stuff requires visualizations: illustrations, drawings, and diagrams. The medical illustrations are exactly those tools that help to convey the information as easier as possible. The Medical Illustrations Solution includes 6 libraries containing 179 vector graphics stencils. 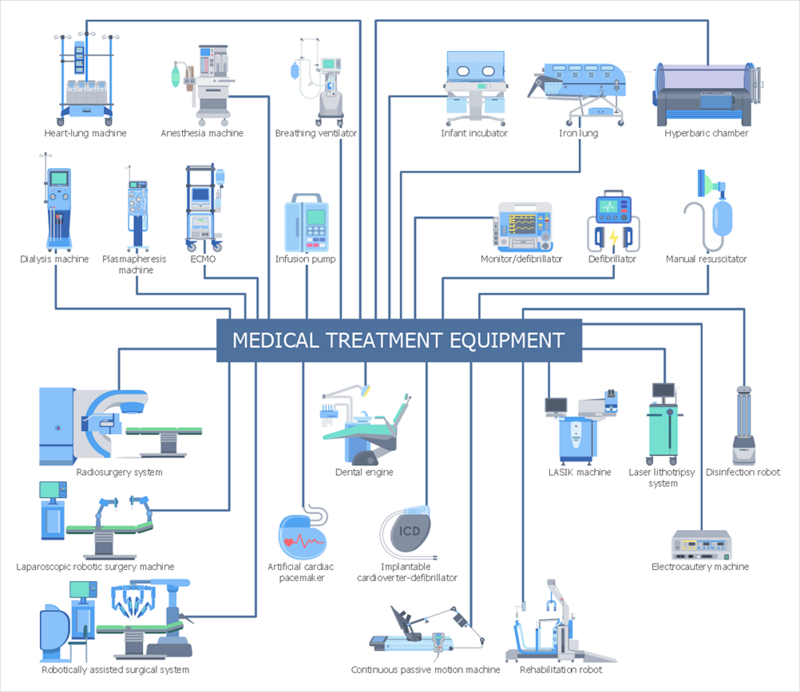 It extends the abilities of ConceptDraw DIAGRAM with ready-to-use vector objects and icons of diagnostic equipment, medical pictograms, and symbols, as well as the set of professionally developed examples and samples related to medicine. Open a new ConceptDraw DIAGRAM document. Select Medical Illustrations item on the Solutions panel. Add the graphic elements to your design by dragging them from the needed library to the document page. Use the Smart Connector tool to connect objects. Select the Tree Mode to connect objects automatically. You can export your drawing as MS PowerPoint® and Adobe PDF files using Export options. Finally, you can perform a presentation using the options provided by the Presentation panel. Result: Using ConceptDraw DIAGRAM you can easily illustrate and share medical visual documentation of any complexity.